Has there been, since the outbreak of the economic and financial crisis in 2008, one single op-ed piece in major international newspapers that did not, in one way or another, refer to Keynes, Keynesian theory and recipes, or Keynesianism as a kind of handbook or roadmap for political leaders dealing with failing banks, sluggish growth, national sovereign debt, or the imperfections of the European Monetary Union? If there were, I must have missed them. It has almost been a decade since the explosion of the subprime crisis and the bankruptcy of Lehman Brothers, and it has been a decade in which John Maynard Keynes’s major work, The General Theory of Employment, Interest and Money (1936), has been enthusiastically rediscovered. It has been praised with the same zeal with which ‘neoliberalism’, identified as the theory underpinning the economic politics of Reagan and Thatcher, has been vilified as the ideology that had led to the crisis in the first place. Economic liberalism – in France almost systematically referred to as ‘ultralibéralisme’ – has not only been widely regarded as the underpinning of unlimited greed and corporate misbehaviour, but also blamed for the apparently cold-hearted, counter-productive austerity measures imposed on entire countries by supranational bodies like the IMF or the Eurozone. 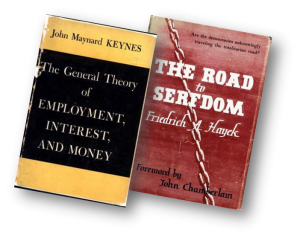 One of the names that inevitable crop up in discussions about liberalist thought is Friedrich Hayek, whose major work The Road to Serfdom (1944) recently appeared in the same shortlist of ‘most influential academic books of the 20th century’ as Keynes’s General Theory (the latter being ranked first). When commentators and editorialists, from national TV pundits to world-wide celebrities like Nobel Prize winners writing columns in American newspapers, start to throw the names of major economic theories at each other, it is no doubt a good moment to get back to the basics and try to obtain a better grasp on the original texts. 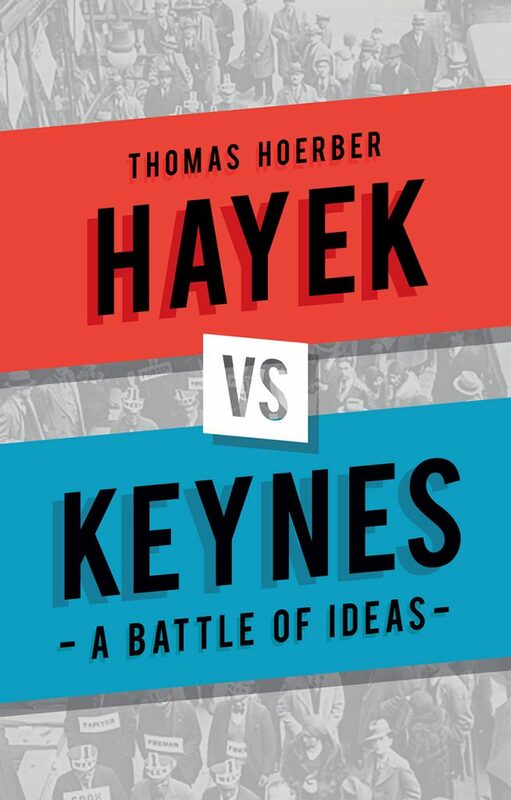 In his recent comparative essay Hayek vs. Keynes – A Battle of Ideas (Reaktion Books, London, 2017), Thomas Hoerber does exactly this. He takes two of the most important classics of economics from the shelf and opposes the thoughts and arguments they contain. The fact that the author, director of the EU-Asia Institute at ESSCA School of Management, is not an economist himself, but an accomplished historian and political scientist with a focus on European Studies, turns out to be very helpful. Especially for readers who are – like the author of these lines – eager to get a better understanding of economic thought and theory, but hopelessly overwhelmed when confronted with the sub-discipline of applied mathematics that economics seem to have become. Here is an author who takes us by the hand, guiding us rather patiently through this battlefield of ideas, and constantly reminding us that economics can, and actually should, be a profoundly social science, providing insight into how society works and how economic measures can, and actually should, contribute to the common good. 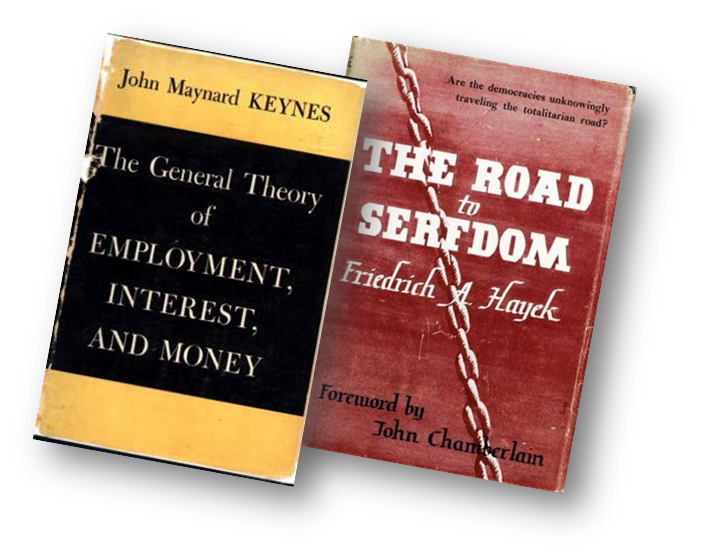 It’s in defining the common good that Hayek and Keynes differ. Is it, in a grossly simplistic nutshell, the overarching objective of full employment, even if this means curtailing individual liberty through imposed state planning? Or is it first and foremost liberty itself, since substantial planning and intervention, even if well-intentioned, inevitably paves the road to … ‘serfdom’? Replace ‘serfdom’, and its old-fashioned connotation to feudal society, with a more contemporary term like ‘illiberal democracy’, and the current relevance of the entire debate becomes painfully evident. While economists (with some degree of justification and credibility) celebrate counter-cyclical Keynesian planning policies as a means to break the circle of austerity and social inequality, such policies may also serve as blank check for authoritarian regimes based on the pseudo-legitimacy of the apparent will of the ‘people’ and displaying a striking disregard for civil liberties and the separation of power. 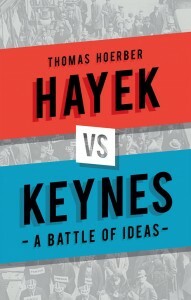 On the 130 pages of his compact and dense book divided in nine concise chapters, Hoerber manages to show that this is not an idle ivory tower debate between two schools of thought founded over 70 years ago, but a fundamental, unresolved, ideological dispute about how the economy ought to be organised and what a good society is. This is nicely illustrated with a chapter that applies the entire controversy to European Integration, a process of supranational market-building based on the principle of free and undistorted competition that neither Keynes nor Hayek could have dreamed of when they wrote their great works. Thomas Hoerber’s essay thus spans the ‘battle of ideas’ from its inception to its contemporary impact. And the winner is …? The current consensus seems to be Keynes, who was recently qualified as ‘a stock value that is rising’ in a Le Monde supplement. But against the backdrop of the massive discursive cycle of rehabilitation of Keynesianism, the author finds himself, throughout his book, recurrently in defence of Hayek, whose work, despite being written in Britain, remains deeply impregnated by the scepticism that is so characteristic of his native Mitteleuropa and certainly deserves to be rediscovered. Whatever the fluctuating penchants of the academic community or the volatile inclinations of an electorate that votes for policies implementing ideas and principles inspired by these great thinkers, the choices made will always depend on the context: time and space are crucial variables. The very currency of the debate illustrates just how much both the Zeitgeist of a specific moment and deeply-rooted cultural, often path-dependent, preferences shape the collective decisions about the society we want to live in. For the French version of this book review, please click here. Albrecht Sonntag is professor at the EU-Asia Institute at ESSCA School of Management, and a member of Alliance Europa. This entry was posted in Current Affairs, Democracy & Citizenship, Economics & Trade, Politics & Public Policy, The EU and tagged economic planning, Hayek, Keynes, liberalism, Reaktion books, Thomas Hoerber. Bookmark the permalink. Previous: Northern Ireland: A Casualty of Brexit? Next: Change of mood on the Euro. Even at EUSA 2017!